The older, better-known of the Trump children were seated front-and-center at the debate, but one siblings was markedly missing. 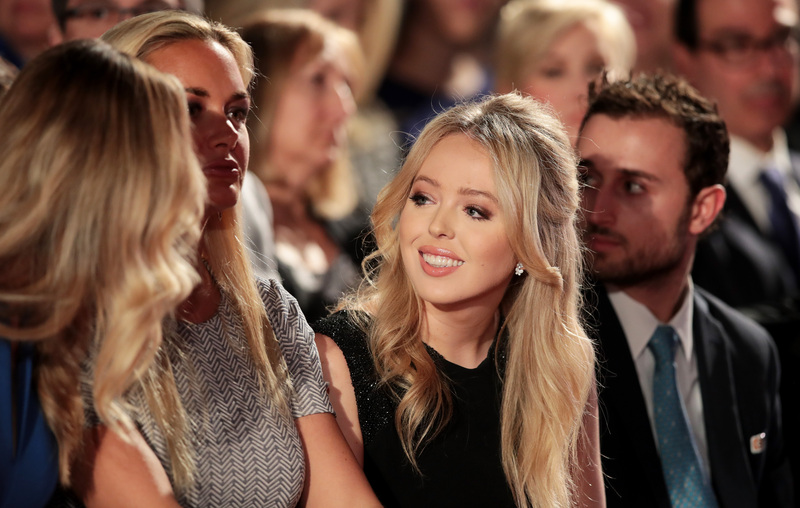 While she was neither seen at the front row nor by the camera, Tiffany Trump was indeed at the second presidential debate, albeit seated off-camera, away from her step-siblings and the spotlight. Although her absence from the line up was noted by some, the seating arrangement was not quite surprising for those who have followed Donald Trump's campaign. Aside from the likes of Chris Christie, Rudy Giuliani, and Newt Gingrich, Trump's most vocal — and powerful — surrogates have been his children. Ivanka, Eric and Donald Jr. have made separate media appearances on their father's behalf, and they were featured in a Children-of-the-Corn-esque campaign ad targeting millennials that has since spawned many memes. Tiffany Trump, however, has largely been kept in the shadows — save for a short, sweet speech at the Republican National Convention in which she praised her father's long-distance parenting skills. Her low-key appearance at the debate may have been a campaign strategy of some sort, but it still looked somewhat like a slight — Tiffany was seated in the same row as the family's in-laws and the women who accused Bill Clinton of sexual harassment. There is not much from which can be gleaned about Donald's relationship with Tiffany, his only child with second wife Marla Maples. When New York Times reporter Alessandra Stanley profiled her for the paper's Style section, the Trump campaign refused to let her interview Tiffany, but agreed to let the young Trump be photographed. But Stanley was allowed to speak to Ivanka, Maples, and other family members and close friends. "I'm sure she could have handled it," Stanley wrote in a separate piece. "Yet the campaign was subliminally suggesting that somehow she couldn't." There is speculation that Tiffany is enthusiastic about taking on a larger role in her father's campaign, and considering his weak standing with women voters, it could well make a difference. But it seems the campaign is either unsure about whether she is prepared or undecided about whether deploying her as a surrogate could be as impactful as Ivanka has been. With less than a month until Election Day, as campaign officials scramble to cover for their candidate's almost-daily missteps, perhaps there will be more of a strategic urgency for Tiffany to be more involved. Lord knows Trump could do with another familial female figure vouching for him.